It is a gorgeous summer in The Pyrenees and many of our Dutch friends are visiting. They come to relax, swim in the lake, enjoy the views and see the vineyards and winery grow. 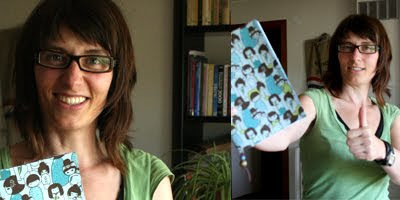 Needless to say, we had fun and I had little time for bookbinding. But, when dear friend Natascha needed a simple travel journal, I wouldn't let her get away with buying a spiral-bound notebook, mass-produced in China. So, I made her a 'quick and dirty' cahier, in less than an hour. This was refreshing as many of my painted or appliqued books take me days, even weeks to make.. 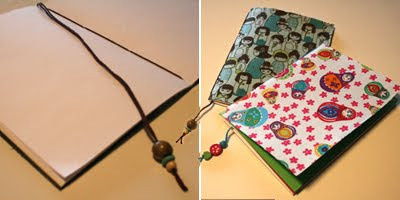 This fabric-covered cahier is simple but still entirely hand-made and bound, pretty to see and nice to touch. Make one yourself? Here's how! 15 sheets of paper, white, coloured or both. I used A4 printer paper (w 297mm x h 210 or 11.7" x 8.3"). cardstock or cardboard, same height as but a little wider than your paper. fabric, to cover cardstock, big enough to leave a margin of one or two cm around your cardstock. Iron creases out if necessary. 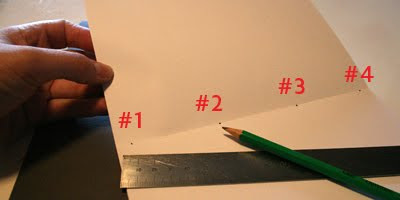 cutting mat, sharp knife, pencil, ruler, and set square if you are a perfectionist. cotton thread, large needle, pair of scissors, one or two beads, paper piercer (optional). acid-free glue (for books or, cheaper, for wood), big brush. bonefolder or wrong side of a table knife. a. Carefully fold your 15 sheets in half using a bonefolder or the blunt side of a table knife. b. Collect these sheets, fold them into one another until you have what begins to look like a book. 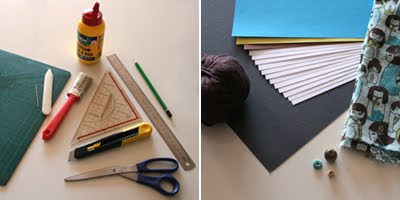 If you haven't done it already, cut your cardstock the same height and a little wider than your paper, using ruler, set square, knife and cutting mat. Fold in half and slip around your book. a. 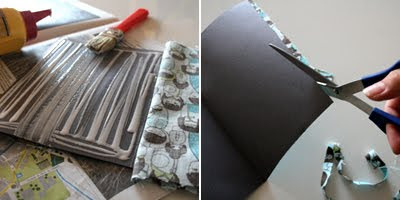 Take your cover off of your pages again, squirt a royal amount of glue onto the front and spread out evenly with a brush (easier with a slightly damp brush). Leave to dry for a few seconds and press onto fabric. b. Make sure you fold your cover before you glue the back to the fabric too, so it won't get too tight. c. Cut the fabric off along the edges of your cover. a. In the crease of your cover mark one cm from the top and one from the bottom. Between those two dots distribute two more so you create three intervals of the same length (with this size paper 6,33 cm each). You end up with 4 dots. b. Take a needle (or paper piercer) and pierce through the dots. a. Cut approximately two metres of cotton thread and put through the needle. b. Pick up your book without cover. From the outside put the needle through the top hole (#1). Pull through and leave a tail dangling that is roughly twice the height of your book. c. Fold your book back into its cover. From the inside pull needle through the second hole (#2). This time go through both book and cover. d. From the outside pull needle through hole #3.
e. From the inside pull needle through hole #4.
f. Now go back up again. Put needle through #3 from the outside, then through #2 from the inside. (left over right, right over left). The knot will be neatly hidden between pages and cover. a. 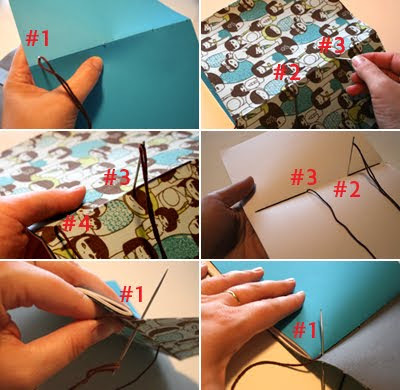 Take both threads over the top of your pages, place them along the inside fold. tie another knot and cut off excess thread. You now have a fully functional and pretty pagemarker. c. Leave the booklet to dry for a while underneath a pile of books. Et voilà: your own hand-made cahier or notebook, containing thirty pages (sixty counting both sides), ready to use! I'd love to see pictures of yours, if you make one! Great one, easy to follow! Nice tutorial. I am not sure I am neat enough with paper stuff to make it well, but I'll give it a try. Great tutorial! And very pretty result! I've been wanting to try to make one for so long but haven't had a moment to do that yet. I even bought a book about bookbinding so it's really something I would love to learn. Your tips helped me for sure, thanks for the inspiration! Thanks everyone! If you make one of these I'd love to hear if you come across anything funny or unclear in the tutorial and, like I said, I would love to see pictures of the results! Thanks to Martice for tweeting this, I missed it! Great, clear tutorial! 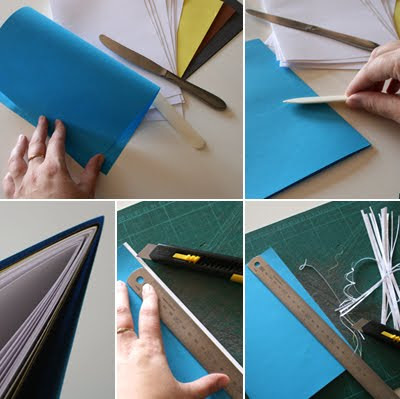 I have not done any bookbinding but I'm sure this tutorial will help me! Thanks heaps for pulling it together! Hey, Marta, thanks for tweeting! Thanks Mitsy, I've submitted it! It's amazing how many great tutorials you post, they are quite laborious to make. And fun too! Excellent! I'm going to have a shot at this one! This is a wonderful tutorial. Thanks so much for sharing. This blog is absolutely amazing, i really like the way how it was written. I must to say it catch my attention since the first time that i read this whole information.Wonderful.